During my senior year of high school, I got a bit annoyed with all of the Shakespeare we had to read and analyze. In an attempt to prove that analyzing plays was silly, I wrote my own. And here it is. Enjoy the story of Steve, vice-demagogue of Earth, who risks it all to overthrow a corrupt regime. Since this is a Tragedy, you can guess what happens. With special appearances by Vince, ruler of the moon, and Boy, from Henry V.
This is a freely available play, perfect for performances by your Drama club! Do it today! The Tragedy of Steve: Third Edition PDF (1.5MB) 1 June 2011: A special 15 Year Anniversary edition released in honor of the actual Steve's impending marriage. trsteve-3.0.1.tar.gz (2.8MB) 8 June 2011 The LaTeX source for the above pdf. It uses the Play class. 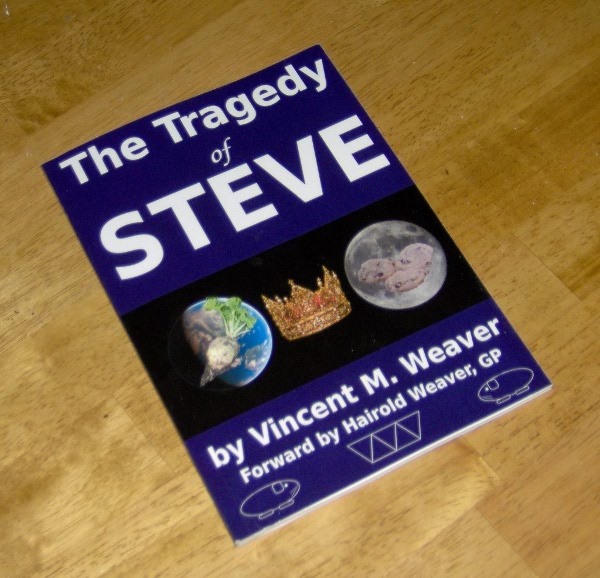 The original first-edition HTML version of The Tragedy of Steve: Typos and all. New! Buy your own printed copy from lulu.com. Your copy won't have the typo on the front like this one does.